Hildale • Supreme Court decision means FLDS property could be sold or given away. Trent Nelson | The Salt Lake Tribune Young women on a walk in Hildale Monday, February 18, 2013. Much of the land in the southern Utah town, as well as in Colorado City across the Arizona border, is owned by the United Effort Plan Trust. Trent Nelson | The Salt Lake Tribune Homes in the polygamous town of Hildale, Utah. The homes are part of the United Effort Plan, a multi million dollar trust. Officials hope to appoint a board of interested community members to oversee the trust. The Utah Supreme Court on Tuesday knocked down a hurdle to subdividing property in the town of Hildale, a key step in selling or distributing property from a polygamous trust. Utah&apos;s top court ruled that officials in Hildale used the wrong legal method to challenge a default judgment entered against the town, and it was too late to challenge the judgment correctly. 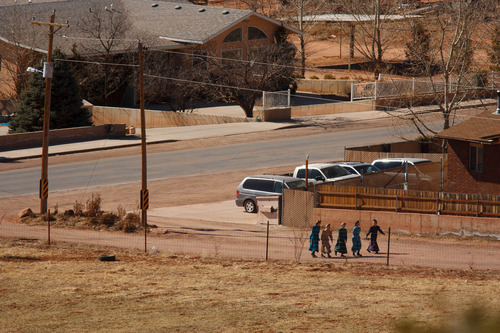 The ruling also noted that Hildale did not challenge a lawsuit seeking to subdivide the town sooner because Warren Jeffs, president of the Fundamentalist Church of Jesus Christ of Latter-Day Saints, instructed them not to. That default judgment, entered in 2010 by 5th District Court Judge James Shumate, said the fiduciary of the United Effort Plan, the trust holding much of the land in Hildale and adjoining Colorado City, Ariz., could subdivide Hildale. Jeff Shields, an attorney for the UEP, said the plats for Hildale are already drawn and the town will be officially subdivided as soon as Washington County processes the paperwork. Shields said the UEP still has to do the engineering work to subdivide Colorado City. That could be completed in a few weeks for about $40,000 if Colorado City officials cooperate and provide records of easements, piping and other infrastructure, Shields said. If Colorado City won&apos;t cooperate, subdividing could cost the trust hundreds of thousands of dollars. "We&apos;re naively optimistic that the cities have had enough fighting," Shields said. The state of Utah took control of the United Effort Plan in 2005 over concerns of mismanagement by Jeffs. The court-appointed fiduciary, Bruce Wisan, would like to sell or give away houses and buildings to people who have lived in or have a claim to them, but has seldom been able to do so because entire town blocks exist as one parcel. 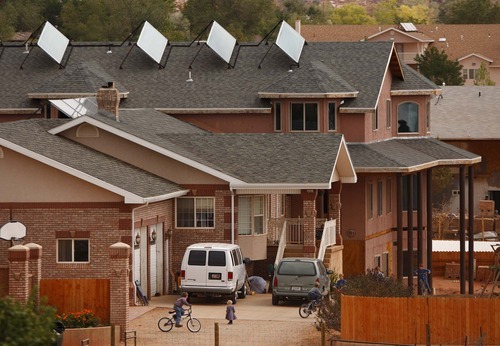 The judge monitoring state management of the trust, 3rd District Court Judge Denise Lindberg, is poised to appoint seven people to a board which may take over the management and redistribute 750 homes in Hildale and Colorado City, known collectively as Short Creek. An earlier version of this article said 5th District Judge Eric Ludlow entered the default judgement in 2007. Ludlow was assigned to the case briefly, but the rulings in question were issued by Judge James Shumate in 2010.